Our CIO recommends Code.org, a site designed to encourage young people to learn coding in school, in order to move into careers where such skills are (allegedly) useful. You know, like mine. There's a long array of famous, semi-famous, and not-at-all-famous people endorsing this effort on the front page, with pictures and encouraging quotes. (Bill Clinton: "At a time when people are saying "I want a hot babe good job - I got out of college and I couldnt find one," every single year in America there is a standing demand for 120,000 people who are training in computer science.") Check it out. 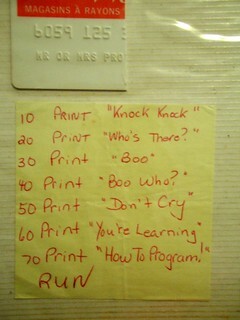 One of my past jobs was trying to teach introductory programming to mostly-unwilling students. Very unpleasant! But maybe I just sucked at it. My snarky take: out of the dozens of people on the page, how many would even know how to start writing a computer program? Could even recognize a control structure or say what an array is? Bill Gates, Mark Zuckerberg, sure. Maybe Steve Ballmer too. But Bill Clinton, Al Gore, Marco Rubio, Snoop Dogg? I don't think so. Greg Lukianoff, the president of the Foundation for Individual Rights in Education (FIRE), has a nice article at Forbes discussing the Florida Atlantic University (FAU) incident where an instructor facilitated an in-class activity where students wrote "JESUS" on a sheet of paper and were directed to stomp on it. A student, Ryan Rotela, refused, complained to higher-ups, and (as a result) was subjected to disciplinary measures. The fact is that universities these days rely on double standards to function, as the overwhelming majority of colleges, like FAU, maintain unconstitutional speech codes that typically ban inappropriate, offensive, or hurtful speech. If the plain language of these codes were followed, they would not last a day, since every professor and student would be found guilty of violating them. In order to exist, these kinds of codes must be selectively applied. The University Near Here has been awarded a red light rating from FIRE for its clearly-unconstitutional speech code. It's only a matter of time before a clueless administrator attempts to enforce it against an intransigent student, and UNH (once again) becomes a nationwide laughingstock. If you're feeling too happy and optimistic, a good remedy is to check out what people are saying about Obamacare. At Reason Peter Suderman notes HHS Secretary Sebelius admission that insurance premiums will go up, and that a study by the Society of Actuaries estimates the rise as 32% over the next three years; and nobody thinks Obamacare's "exchanges" will be ready to go when they are supposed to. At NR, Yuval Levin has a long post highlighting that the Obama Administration is urging its spokesdroids to stop claiming that Obamacare will bring healthcare costs. People, you see, might get upset about such blatant lies made to their face. And even the way-too-optimistic "rosy health-costs scenario" predicts eventual fiscal disaster. So we're screwed unless politicians (and the voters who elect them) put on their big-boy pants and start taking this seriously. And what are the chances of that? If you're using the default view of Pun Salad: over on the Books page, I look at Holidays in Heck by P.J. O'Rourke and Way Down on the High Lonely by Don Winslow. On the Movies page, recent entries are for Zero Dark Thirty, Argo, Wake in Fright, and Wreck-It Ralph. And you probably already know the general story: it's the based-on-fact story of how Osama bin Laden was tracked down and killed. Spanning many years, the focus of the story is "Maya", a young woman recruited out of high school by the CIA (they do that?) Her entire career has been about bin Laden. She's (variously) profane, obsessed, shrill, egotistical, and abrasive. And one of her colleagues calls her "[adjectival form of a very bad word] nuts." But (as you know) she was also effective and correct. It's an effective, gritty, spy sorta-thriller, with the extra bonus that it's all sorta true. The controversy around the movie is almost more interesting than the movie itself. (See Wikipedia for starters.) Mostly it swirls around the movie's portrayal of what the bed-wetters call "torture" and the euphemizers call "enhanced interrogation techniques"; what was done, who was it done to, and did we get critical information as a result? Lefties go (predictably) ballistic at any suggestion that "torture works". Michael J. Morell, acting CIA Director when the movie came out, wrote a letter that criticized Zero Dark Thirty for creating an "impression" about the techniques' effectiveness that was "false". But, like a good spook bureaucrat, his wording is ambiguous. Leon Panetta, CIA Director from 2009-2011, claimed otherwise. It's a sensitive topic, but given the intense political pressure, I'd tend to bet on the "hell, yes, it was effective" side. I've been a fan of my fellow Granite Stater, P.J. O'Rourke, since the 1970s, when he wrote insanely funny stuff for the old National Lampoon. Now he's older, cut down on the drugs, ramped up on the cigars and whiskey, and got libertarian/conservative. Hey, just like me. Except for the drugs, cigars, and whiskey. The title of this book is a takeoff on his 1988 book, Holidays in Hell, where he recounted visits to various world hotspots. Things are calmer now, and nobody is shooting at him, at least not on purpose. P.J. checks out a Lindblad cruise to the Galapagos; the WW2 Memorial and other touristy attractions in Washington D.C.; Kabul; mainland China; Kyrgyzstan on horseback; (unfortunately) the Norris Cotton Cancer Center in Lebanon NH; and many other places. P.J. 's very observant, very cynical, very opinionated, and very funny. Every page has a chuckle or unexpected insight. He's rarely in awe, so when he is (on the USS Theodore Roosevelt aircraft carrier, or in the Three Gorges area in China), one pays attention.